We asked these nursing students why they're going to Urbana 12. Their passion, vision and love for the Lord impressed and inspired us! Student 1: I want to become fully immersed in Christ's message and learn how to relay that mission to the world. 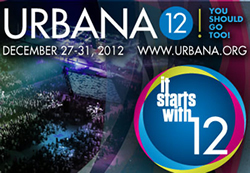 Urbana is a great way to end 2012 and start 2013 and shape resolutions that could turn into life goals. Student 2: I am very interested in medical missions and want to piece together my faith and my career as one and grow in my relationship with God. I want a broader view of Christianity. Student 3: I heard from others that Urbana is an excellent conference to challenge Christ-followers to have a more global, Christ-centered perspective while learning from gifted and knowledgeable speakers and having community with other Christ-led individuals. Student 4: As a nursing student, my heart is to serve the Lord and help people in other nations so I’m looking forward to the mission component of this conference. I am graduating in a few months so this is a pivotal time to connect with individuals and organizations that are serving Christ and may possibly have a place for me to join their mission. Student 5: I have a passion for other cultures and feel God calling me to consider international missions as my future. I want to learn more about God's heart for missions and also about ways that I can get involved with the international missions movements: how to pray for them and how to join them some day. Student 6: As a soon-to-be college graduate, I need direction in how I can better serve and commit to God's calling and use my career to honor Christ and make him known to patients and other coworkers. Student 7: I aspire to be a missionary nurse and use my clinical skills and knowledge however and wherever God leads me. . . I want more exposure to global realities, especially about healthcare. Above all, I simply want to praise God and experience his love with people that also share the same love for our Heavenly Father. We praise God for his presence in the lives of these nursing students who received NCF scholarships for Urbana 12 in Saint Louis, MO. Join us in praying for God's transforming love and power as thousands of students gather December 27-31, 2012. Greate post. Keep posting such kind of info on your page. Im really impressed by it. Hey there, You've performed an excellent job. I will certainly digg it and in my opinion suggest to my friends. I am sure they'll be benefited from this site.